A little bit of history - I'm around 200m away from my local FTTC cab (ECI - sad times) which was enabled back in 2013. I've been a subscriber since 2013, I have always been on the Infinity 2 product and at the start used to achieve at least 75mb downstream. Obviously more and more people have come online over time and introduced crosstalk, so I've lost around 15mb over the last 2 years in particular - I'm down to around 61/62mb now. Is that a common experience for most? My modem is plugged straight into a new MK4 master socket, no extensions, just wires a and b terminated. I now have a new HG612 modem (unlocked) so I'm able to grab my stats. My line is pretty much the exact same electrical length more or less I have also had FTTC since it was available in 2013, and had the top speeds back in the good old days. Your stats look good to me the only thing that's notable is the higher noise floor on the QLN graph which shows that allot of cross-talk is in play, i'm also highly effected by crosstalk as uptake is high. I'll attach my stats so you can compare. Only thing of note other than that is 14.3db is ~320-350m line length as far as I am aware which it the tail end of G.Fast doing anything which is rather annoying. I would say that 14.3 dB attenuation is either somewhat more than around 200m or using cabling subject to attenuation such as aluminium and/or 0.4mm gauge copper (or maybe even 0.4mm aluminium, which is the worst of both worlds). Like with @S.Stephenson's example, your line is probably closer to 350m (in terms of attenuated distance, though it could a bit longer or shorter). When more subscribers are added to a cabinet, it is not unusual to lose 10-15+ Mbps on the downstream (or even more if you were one of the first subscribers on a heavily subscribed cabinet). Though, it does ultimately depend on so many different factors beyond the amount of subscribers. If you were one of the first subscribers on the cabinet then 15 Mbps is not too bad but perhaps you should clarify what you mean by achieving 75 Mbps; was this as throughput (the speed seen when downloading, speedtesting, etc.) or as synchronisation speed? Since sync != throughput as there is a small overhead. With people within 200m or so of the cabinet, it is not usual for them to see any speed loss as they are close enough for their margins to drop while still being able to retain full sync (unless there is a fault, bridge tap, a LOT of crosstalk or low gauge cabling susceptible to attenuation). Though a lot of us under 200m that have access to stats will see our "max" (or "attainable") speed drop dramatically as subscribers are added to the cabinet. If I recall correctly, the original (first) line in the property started off with an attainable of something like 100/35 Mbps (DS/US) but now it is something like 85/25 Mbps with the actual sync at max 80/20 with G.INP and maybe a target SNR of 4 or 5 dB on the downstream. Even still, that is an attainable loss of about 15 Mbps on the downstream and 10 Mbps on the upstream (and I imagine the impact on this figures would be a bit more in the absence of G.INP). The stats seem OK. Nothing is showing out of the ordinary for what the line is. I do remember that you created a topic about G.fast that I particpated in, and these stats do give us some insight into what you could expect when it is rolled out. The good news is that you should almost certainly get around or over 100 Mbps on G.fast at your distance; the estimates seem to be fairly accurate based on your stats and approximate length based on attenuation, perhaps a bit overzealous but you'll never know until it is activated. Though I cannot comment on the upstream, though it seems like the estimates would point to some loss in that respect. When I say good news, perhaps it's not such good news for yourself as you expected better from G.fast considering your physical distance from the cabinet. my line originally (first on cabinet) was 110/36 and thats on a 360m line with 50m of ali. (yes I believe BS was joking about the no ali part). attenuation as reported on modem of 15db so higher than the OP. Its been up and down, but the attainable sync originally only stayed above 80 for a few weeks, it nosedived extremely quickly. It hit a low of under 60mbit DS, but openreach and CP recognised that as faulty and it triggered a pair swap, since last august up until a couple of weeks ago it was synced at full 80/20 and during a power fault in cabinet last august I could see attainable regularly hitting mid 90s, right now its synced at just under 74 and 20 up, attainable is about 76/27. This huge variance in performance has largely been down to crosstalk with 'maybe' the exception of that sub 60 sync that triggered a pair swap. @Chrysalis: it would be interesting to see the attenuation for the individual bands since that seems a pretty decent sync speed for the stated distance. It's possible the OP could be in a similar position as you were before when your sync dropped but OR probably won't fix it in this case because "if it ain't broke ..." and they have had virtually the same sync since sign up (so the DSL Checker probably shows estimates on par with the sync). @sotonsam: I cannot remember if you posted anything in relation to your VDSL estimates in your other thread (and a quick scan through didn't pick up anything). Maybe you could show your clean and impacted estimates? re0 compared to international vdsl testing data my speeds are nothing special. In fact the speeds I have seen on this line when its below 70 are actually poor compared to international testing data, the reason is the reported levels of crosstalk reported on openreach copper/ali has been on the high side of expected levels of crosstalk. By the time my line dropped below 60% it has lost circa 50% of potential line speed to crosstalk, that is most definitely on the high side. However on the flipside compared to others around me I am now faring well which is another interesting story in itself. Yet my current attainable is just over 75mbit. So on that basis i am doing well. However before my cabinet fault last august, my clean low estimate was alot higher at close to 70mbit, and my line was not much above it. The lottery got rerolled when tie pairs had to be redone, I came out a winner, but also the losers had noticeably worse performance than the losers had before the tie pairs were done hence the estimates plunging. That was when I also realised a big part of crosstalk is close to the cabinet even at the tie pairs themselves, I also remembered when black sheep told us when they did thermal imaging of tie pairs showing the levels of crosstalk at that point. Given a port swap involves changing tie pairs (engineers cant go in a vdsl cabinet, so to change a port they simply swap tie pairs) I now understand why port swaps can fix problems people have. Thanks for everyone’s input and replies so far, appreciated. Thanks (I think??) for the corrections on my line length It must go some weird route, as I can see the cab over the road from my window. Never mind. When I first ordered FTTC it was in its infancy when you had either Opeanreach of Kelly's guys coming to your house to fit a SSFP etc. They used their testers on the socket and my line was easily getting a sync speed of 75. This was echoed by the speed tests when I was fully online - so when I said 75, that was the 'sync' profile on my line - I got about 73mb in throughput. I think my general expectation now with G.Fast is that it will probably equal minimal improvements for me, and if as suggested below I'd actually get a hit on my upload then I probably won't bother. Upload is the key bit for me, so I was hoping I'd get a boost to that as well! Virgin Media is looking more likely by the day in my quest for speed..! So here are my estimations based on my line, so based on that I'm probably doing ok - I'd say I'm probably as low on clean as possible. Unless my stats suggested I'm impacted? @Chrysalis: I cannot say I am aware of what specifications they abide by when doing the VDSL testing (in reference to international VDSL testing, as you mentioned). Perhaps you could provide a source that you used for me to read into? Though, there will always be people below and above the bar (average) just as variation ... which is typical in every scenario. On your graph, there is a bit of a dropoff at the higher frequencies, but that could be quite normal - and, for myself, since I have changed my modem I have noticed that some of the higher frequencies seem a bit more impacted compared to the previous one (though it does perform the same with virtually the same attenuation and attainable overall). But yes, compared to some in similar circumstances you are certainly receiving more. @sotonsam: The information that we provided are not necessarily "corrections", but rather what we can make of the information you have provided. As I said in one of my posts, I implied the line is attenuated to the point where it is behaving or has the characteristics equivalent to something that is about 350m of length (from the cabinet). In reality, however, the line could be a lot shorter but impaired by a lot of crosstalk and/or a lot of aluminium with a small gauge was employed - or perhaps it is just a longer line due to routing. Only Openreach can know. The impacted range applies to lines which have wiring issues (including Bridge Taps, etc. ), while the clean range is a line free of any of the aforementioned issues. On the DSL Checker, there is some information under "Premise environment" which shows information regarding the line such as Bridge Taps and VRI. ISPReview (https://www.ispreview.co.uk/index.php/2017/07/bt-wholesale-broadband-checker-adds-options-vri-ntefaceplate.html) has some helpful information regarding this and what the information means. I can agree that the G.fast is showing minimal improvements, but we can't know it until it ACTUALLY becomes available and you have the service activated with your ISP of choice. But I don't think you could expect any more than the 20 Mbps you are receiving now. As always: estimates are estimates. Yes, it seems you are at the lower end. But by any means, it seems like the speed you have lost over the period of time was because of crosstalk and you are within the estimates provided. Though one thing I would like to ask, if you know, what was the estimate/guarantee that the ISP provided you with when you signed up/regraded? On your graph, there is a bit of a dropoff at the higher frequencies, but that could be quite normal . . . I call that the "tail end droop" and it can be seen, to a greater or lesser extent, on all circuits connected to an ECI Hi-FOCuS M41 DSLAM. Big thing with G.fast right now is i'm pretty sure they only have rev2 gear out in the field unless i'm mistaken. So G.fast speeds could be more impressive at the line length you have. Im seeing a potential ECI type situation with rev2 vs 3 Openreach isn't one for replacing inferior gear if they can help it. The rev3 stuff should have more ports and increase the range and speeds. re0 they estimated 67mbit and guarantee I think low 60s. If I ever get a speed related fault, I will hold them to what was given to me at signup, I dont know if sky will ever try to push this handback rubbish on me, I hope I dont need to find out. When I used to watch sky support forums on fiber pro, they honoured signup estimates. The fault back in august was for loss of service so speed was never a part of that discussion. I most definitely do not consider my line faulty right now tho, what I mentioned here is just providing information for others to read. I wish I could remember what my sign up estimations were. I've drilled through my emails and order forms from 2013 and cannot find anything. I don't think I'd have much to stand on anyway, like you say it does look as if my sync is influenced by crosstalk more than anything else. At least my stats look pretty much spot on for my line. The new modem has certainly improved my latency though, that's something I've noticed. Not sure if that's a common find with the HG modems over the ECI? yeah your stats are not the best for the attenuation but I have also seen worse, the QLN is pretty high so I believe its likely to be crosstalk related which is nothing you can do about it. We know the line is reasonably stable as you on fast path. Out of interest, what shows that I'm on fast path on the stats? My line has always been pretty stable to be honest, it maybe rsyncs without my input once every 4/5 months. This is why I'm pulled between this and VM, as VM would lose sync once or twice a week and I could be without it days at a time sometimes. At least I get an always on connection here and I guess it's sometimes a case of the grass isn't always greener! Back in the days of ADSL2+ I was with BE (amazing ISP for the techy types!) Having the ability to alter your SNR/Fast path via the control panel was epic, something I don't think is avaliable out there anymore? One thing I've always wondered about is DLM and what forces this to kick in - i.e. if I manually restart my modem a couple of times a week, would that force it to kick in? I wish I could remember what my sign up estimations were. I've drilled through my emails and order forms from 2013 and cannot find anything. Perhaps you could find the estimates in your account? I don't think I'd have much to stand on anyway, like you say it does look as if my sync is influenced by crosstalk more than anything else. If it is below the estimates or minimum guarantee then you would have a leg to stand on, though they may only offer to release you from your contract (if you are in one still) without penalty. But if it is believed that significant improvements can be made or if the line is deemed to have a fault then an engineer could be sent out. But I should say that it doesn't seem there is a fault. The new modem has certainly improved my latency though, that's something I've noticed. Not sure if that's a common find with the HG modems over the ECI? I personally don't know if there would be any significant differences between using the ECI and the HG612 modem in reference to latency, especially without any stats from each of the two devices. Though, the differences in latency could be contributed to from your ISP routing perhaps taking a different path (because you have been given a different gateway for your PPP session)? It is not unusual for major ISPs to have multiple gateways that have varying latencies, though most are probably within a couple of milliseconds of each other. I know that if Bearer: 0 exists alone then it is in the absence of G.INP (which is to be expected on ECI), but I cannot see anything in your stats that would imply you are on fastpath (your stats are truncated, so I can't see what the delay is). Though, on FTTC, it is a bit different compared to ADSL in the sense that you can still have interleaving in the form of G.INP on Bearer 1 but the delay on the main Bearer can still be set to 0 (no delay). Back in the days of ADSL2+ I was with BE (amazing ISP for the techy types!) Having the ability to alter your SNR/Fast path via the control panel was epic, something I don't think is avaliable out there anymore? On FTTC, no. If I recall correctly, the closest you can get to this is with TalkTalk's LLU ADSL2+ broadband where you can register and request specific profiles and the disabling of the DLM. 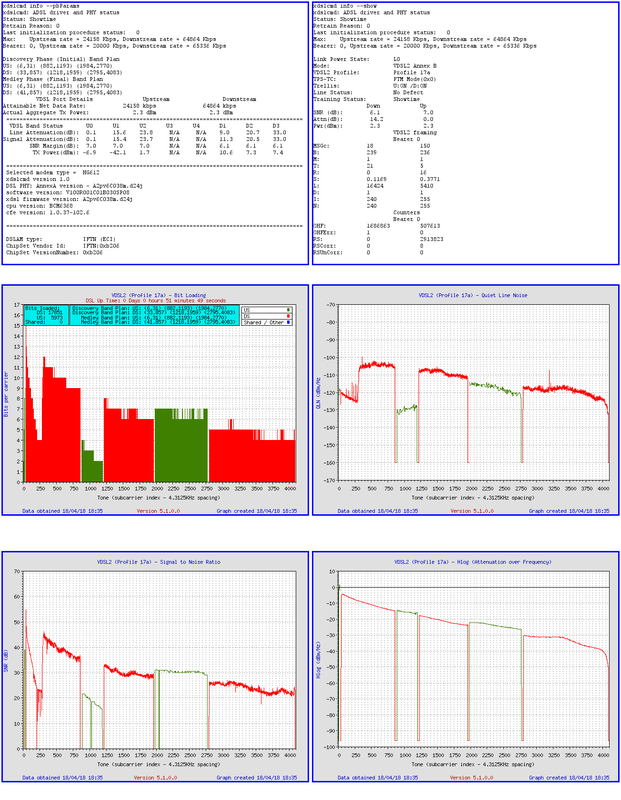 The DLM records data over a 24h period. From that data, it decides on whether it needs to make positive, negative or no changes at all. There is quite a bit of information relating to the DLM on the kitz site (http://www.kitz.co.uk/adsl/DLM.htm) which outline the thresholds. To put it simply, there are defined thresholds which allow the DLM to categorise the line through the Mean Time Between Errors (MTBE) and Mean Time Between Resyncs (MTBR) that depend on the stability profile set by the ISP. Amber just signifies no changes, while green and red will allow for positive and negative changes likewise. Changes typically take place early hours in the morning (I believe somewhere around 4am usually). To answer your hypothetical question above, restarting your modem a couple of times a week wouldn't make any difference at all since on the Speed DLM profile (as an example) the MTBR would have to drop below 4200 seconds (or 70 minutes) so you would be able to restart the modem up to around 20 times a day in theory without any impact (though I wouldn't try it). I should go on to say that there's a chance restarting a modem may not be treated the same as a link drop because of something to do with a "dying gasp" ... perhaps b*cat or some other experienced person could confirm.